Special thanks to Brain Baker for photo and info. Back in 1969 when I got home from South East Asia I took a trailer load of old tires to the track for Rick. It was right after the track was paved, also #16 had a 427 ci in engine installed, Rick was the first car and driver on the newly paved track. The reason I remember this so well was he let me take #16 for a few laps on the track. A day I will never forget. Thank you Rick Zettel. Just wanted to thank everyone for keeping the memories of the West Branch Speedway alive. As I write my father's obituary it is helpful to see the impact he had on others. He and my mother were active in the American Legion and instrumental in creating the West Branch Speedway. My favorite race car was number 16 and the driver Rick was my dad. My family spent many hours at the American Legion Speedway. I personally worked in the concession stand, pit house and gave trophies to the winners. Many times that was my dad. We had a house full of trophies to prove it. My mother drove my dad's car in powder puff events. We had many family times that revolved around the races and yes many trips down Valley Street to test the car. Racing back in the 50's, 60's and 70's was fun and exciting to watch at the West Branch American Legion Speedway, especially the modified cars. With my favorite Rick Zettel, a multi-year track champ and family relative, running the #16 Stroh's car and eventual Michigan Racing HOF West Branch driver Bob Kingen, coming into his own driving the #82 Al Lutes (eventually son Gary Lutes took over) car out of Tawas, the racing really got turned up a notch when the track was changed from dirt to asphalt in the mid 60's. These weren't girly drivers like today with Haans devices, fancy protective gear and wind shields! These were men who built and set up their own track and cars. I can attest to the sound car building when one hot summer evening the 16 car, rather than broadsiding a couple of cars spun on the corner ahead, drove right off the end of the track into a spectacular multiple end for end flip. And he (Rick) walked away. That was some selfless classy driving and I bet there was some serious beer drinking after that one! Other notable drivers included Don Long out of Tawas in the Lutes #85 car, Moe Server out of Standish in the #69 car which was in the style of the Lutes’ model -A cutback but with little paint. Other West Branch favorites were Gary Kaiser in the #17car and Terry/Gary Benjamin in the #46 car. Jay Bedtelyon created a unique chopped and channeled modified car as well that he never could get up to speed as I remember. Mike Schraven pulled his #5jr car down to the track on a fairly regular basis from Oscoda. Bob Kingen ran a year or so in the #86 white Lutes car (pic not available). I wish I could remember who had the #5 Texaco car, I think it was a 32 Ford from Standish area. A few of the notable stock car drivers at the track were Dale Zimmerman, Ted Selle (USA 1) and Tom Rosebrugh. All the spectators did get to see the famous Michigan race car builder/driver Ed Howe (The Green Hornet) make an appearance at the track as well as the young gun, 17 year old Mike Eddy. I personally got to drive the track with my friends, during a few intermissions, in our go karts! However, my favorite memory though was that even though kids could ride in cars at intermission sometimes, I never got to ride in my favorite #16 car. One Saturday morning after the races (was about 10 years old) I was over to my Cousin Doug’s house and Rick was washing his 32 Chevy racecar outside. I was a kid in awe and he said “do you want to go for a ride?” Doug and I piled in, it had to be the fastest and loudest trips down Valley Street a ways and back anyone has ever had! Thank God Howie Hanft wasn’t a cop yet!. I also remember old number 16. Rick Zettel was a favorite of everyone and the one to beat. When the Zettels lived in WB on S. Valley Street they had a dirt track in their yard for all the neighborhood kids with the bicycles. It was fun on that track during the week and then fun at the big track on the weekend. I remember when they would let loose a greased pig at the Speedway for all the kids to try and catch for a prize. The closest I ever got was getting black axle grease on my sweat shirt. When I was a little older and had a local store I sponsered a young lady in her hot rod, an old Dodge Charger, her and her gang worked on the car most of the summer and then the first time around the track for a lap time she kept her foot to the floor and ended up way off turn 3 in the brush. She was okay but the engine was still a roaring and her foot was still to the floor. I believe that was the end of her racing career. I also remember snowmobiles racing at the track, not sure how many of those races, but local teacher Tom Alley was a favorite for sure on his Ski-Doo. Hello. My name is Eric and I am a reporter for the Ogemaw County Herald newspaper in West Branch. If I can get enough info, I think it would be cool to do a little feature story about the old racetracks in the West Branch area. Please, if anyone has any information, or knows people I should speak to, please e-mail me at Eric8199@gmail. com or at reporter@ogemawherald. Sounds great, run by Volunteers eh. Just like Waterford, Just the way a new stock car track between Port Huron and detroit should be. That''s the right concept. Just like the packers are owned by the city. I remember attending in the early to mid 60s. It was named American Legion Speedway and was paved somewhere in that time frame. 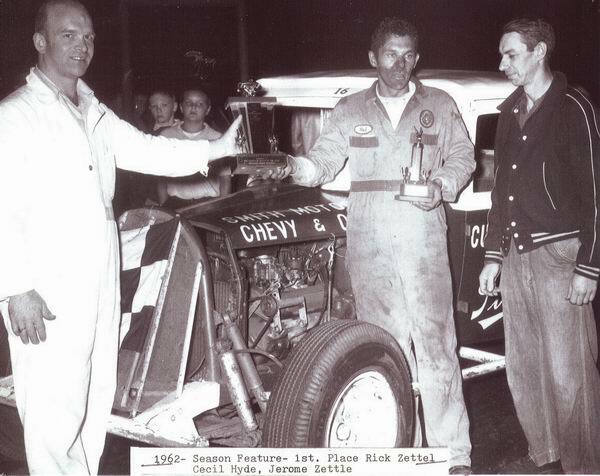 Local racers Rick Zettel and Bob Kingen (later inducted into Michigan Racing HOF) were the guys to beat in their modified Fords with small block Chevy power. Ed Howe made appearances as well. The track was located on highway M-76 about 2-3 miles south of West Branch. The last time I was by there I had brought my wife up to see the track. Unfortunately there was a logging company put on top of it. My dad and I had stumbled upon it several years prior and the asphalt was still intact with very little weeds coming through. Remnants of the bleachers and the flagstand were still visible when he and I were there.